Fake Coca-Cola Openers, Buyer Beware!!! : The following three openers are recently made fakes. The material used is brass and brass does not hold a magnet. Other differences are noted and a comparison made between an original Baseball Player and a fake. All three fakes are slightly larger than originals. Please be careful! The most anyone should pay for one of these is $10. They have been selling for as low as $3 apiece. Fake brass A-9 Baseball Player Opener. The town name is the first giveaway. The town is Canton, Ohio not Canton City, Ohio. Second you never see the word drink in lower script letters on original openers. Fake brass A-21 Spinner Opener. First originals have B&B (for Brown & Bigelow) stamped on the front or back of the opener. Second Spin to See Who Pays was never located in this spot on originals. The opener spinner punch is off-center on fakes and finally the sleeve line extended out along the top on originals. Fake brass A-12 Sword Opener. This is the closet fake to the original. Has been darkened to give the appearance of being old. Much fatter than an original sword opener. 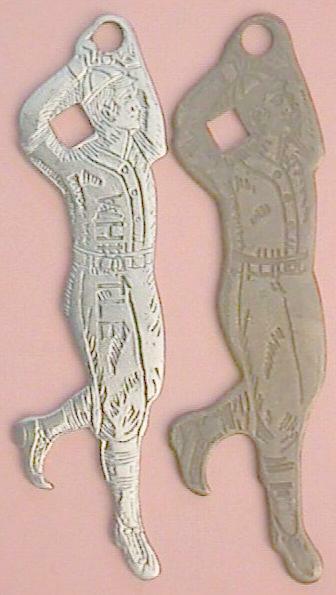 Real (left) and fake (right) Baseball Player Openers side by side for comparison. When comparing the opener foot is much larger on the fake.